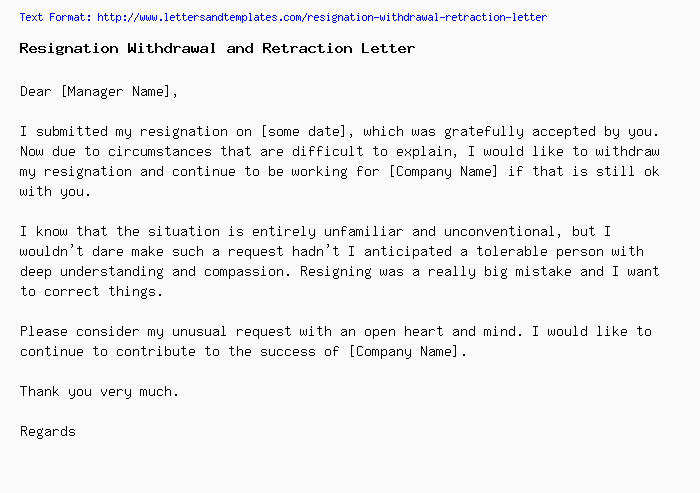 I submitted my resignation on [some date], which was gratefully accepted by you. Now due to circumstances that are difficult to explain, I would like to withdraw my resignation and continue to be working for [Company Name] if that is still ok with you. I know that the situation is entirely unfamiliar and unconventional, but I wouldn't dare make such a request hadn't I anticipated a tolerable person with deep understanding and compassion. Resigning was a really big mistake and I want to correct things. Please consider my unusual request with an open heart and mind. I would like to continue to contribute to the success of [Company Name]. You have requested for your resignation, which was submitted on [same date] and accepted by the coompany on [some other sate], to be withdrawn. Well, I am glad to inform you that the management has accepted to revoke your resignation and to reassign you to your old post. Your contract, benefits, and compensation will be the same as before your resignation.